I want to live in Sarah Beth Durst’s brain. Every time I turn around, she has a new book out, and it’s completely different from the last one. Her imagination is seemingly boundless. Another thing I appreciate about her books is that they stand alone. Don’t get me wrong, I like a good series as much as the next girl, but there’s also something to be said for a self-contained novel. Laini Taylor, author of Daughter of Smoke and Bone, provided the front cover blurb for Conjured, and I can’t think of anyone more fitting. I’d call Conjured “the Sarah Beth Durst book for Laini Taylor fans.” In a few of its broad lines (girl in our world who is threatened by secrets from a parallel, dreamlike world), it’s similar to Daughter of Smoke and Bone and will probably appeal to a lot of the same readers. Yet it’s also distinctly its own story. Durst introduces us to Eve, who is currently in a witness protection program and remembers almost nothing of her life to this point. She can also use magic, but that’s risky — for one, it will draw attention; secondly, whenever she uses it, she has disturbing visions and loses days or even weeks of time. Her visions show her another world, very different from our own, one where magic is rampant and where Eve seems to have been attached to a macabre carnival. These visions are fragmentary and cryptic*, but hold the solution to a serial-killer mystery as well as the truth about Eve’s past and true nature. While Eve is trying to untangle this knot, she’s got problems in our world too. She’s unsure who she can trust. Can she believe the agents who are protecting her? Or do they have a sinister agenda? And how about the clique of other magical teens she meets — what’s their angle? There’s also a love story. It took me a little while to warm to Eve’s love interest; he makes a comment at their first meeting that read as really obnoxious to me, and I thought he was kind of a cocky jerk. But as his character was revealed further, and that remark was put in the context of the chatterbox no-filters way he spoke in general, I warmed to the guy. He’s sweet and brave and nerdy, and he and Eve are good for each other. Also present is what feels like a hallmark of Durst’s work, now that I’ve seen it in three different books: a great sense of teamwork between romantic partners. Conjured can feel a little foggy at first, since Eve knows so little of what’s going on, but the story will reward your perseverance. Durst brings a trippy, creepy world to life in memorable imagery, and unfolds a moving psychological journey for Eve (for the latter, she employs some clever tricks with point-of-view). It won’t be for everyone; it’s more right-brained than left-brained and requires some willingness to be a little confused at the beginning, but readers who love dreamlike vistas and unreliable narrators will enjoy Conjured. And for all its creepiness, it is also, in the end, hopeful. *One weird thing about the visions that threw me a little — it may be a spoiler, so highlight if you want to see it: from the visions, I inferred that the murders were taking place before audiences, and that the audiences were either simply bloodthirsty or fooled into thinking the deaths were fake. Yet later in the book, it seems that this isn’t quite how the crimes were being committed; perhaps the answer is that the visions were not always literal, or that Eve was conflating things in her jumbled mind, either of which is perfectly plausible. 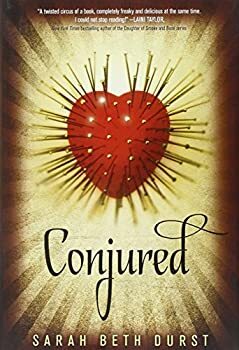 Conjured — (2013) Publisher: Eve has a new home, a new face, and a new name — but no memories of her past. She’s been told that she’s in a witness protection program. That she escaped a dangerous magic-wielding serial killer who still hunts her. The only thing she knows for sure is that there is something horrifying in her memories the people hiding her want to access — and there is nothing they won’t say — or do — to her to get her to remember. At night she dreams of a tattered carnival tent and buttons being sewn into her skin. But during the day, she shelves books at the local library, trying to not let anyone know that she can do things — things like change the color of her eyes or walk through walls. When she does use her strange powers, she blacks out and is drawn into terrifying visions, returning to find that days or weeks have passed — and she’s lost all short-term memories. Eve must find out who and what she really is before the killer finds her — but the truth may be more dangerous than anyone could have ever imagined. Oh, I’m going to order this one today!